The great Polish contralto, Ewa Podleś, is not only something of a unique artistic phenomenon, but also a remarkably elusive performer. As far as one can tell from online performance archives, her sole appearance at the Royal Opera was as Hedwige in Rossini's Guillaume Tell in June 1990. Her appearances at the Metropolitan Opera, New York, are limited to the title role in Handel's Rinaldo in 1984, and La Cieca in Ponchielli's La Gioconda in 2008. For whatever reason, the majority of her operatic career takes place with other opera companies in the USA and Canada, as well as in Spain and elsewhere in Europe, and she doesn't tend to crop up in the celebrity recital series at London's Barbican or Royal Festival Hall. Neither is her recorded legacy particularly extensive. Nevertheless, the claim made in her biography in these CD liner notes that she is 'widely regarded as the world's foremost contralto' is a just one. This release from Wigmore Hall Live is therefore most welcome. A contemporary review from the New York Times of Podleś's Met debut surmised that 'Miss Podleś proved herself a singer of real vocal quality whose smallish but flexible voice should suit her for many other roles in the coloratura mezzo repertory… her tone was smooth and unforced, and her range was equal to every demand made by an extremely difficult part.' Things have changed a great deal since then. I don't think the word 'smooth' would spring to any critic's mind to describe her vocal production now – Podleś herself has spoken of the inequality in her registers and associated audible gear changes in her voice in interviews, and whilst her lower range might be described as wonderfully cavernous, the same effect in her middle voice can come across as foggy. What is more surprising however is the description of her voice as 'smallish'. The most striking feature of her voice, going hand in hand with its arresting timbre, is its vast size. A voice's true size will always come across far better on a live recording compared to a studio recording, and this feature of Podleś's instrument has been captured vividly by Wigmore Hall Live's sound engineers. The programme for this recital is an interesting one, consisting of some rarely heard Chopin songs, a selection of Rachmaninov and Tchaikovsky songs that mixes popular favourites with less frequently performed items, a solo piano suite by Szymanowski, and Mussorgsky's great cycle 'Songs and Dances of Death'. Opening with the Chopin, Podleś sounds instantly at ease in her native language, and packs these charming songs with personality. The delivery of the text has a beautiful, natural lilt, for instance in 'Pierścień' where an effective rubato is used through Chopin's sequences to convey the protagonist's sadness and optimism. In 'Wojak', Podleś lets rip for the first time, pouring out sound at the decisive climax. Her musicianship comes to the fore in 'Śliczny chlopiec' which describes a young girl's breathless thoughts about her feelings towards her handsome lad. Although there is nothing intrinsically girlish about Podleś's richly hued, no-nonsense voice, she captures the mood with deft skill and plays with the song's mazurka rhythm as stylishly as any great Chopin pianist. That her accompanist, Garrick Ohlsson, is always with her is testament not only to their artistic empathy, but also the inherent logic and idiomatic correctness behind the singer's approach to the music. The atmosphere is utterly different when the Rachmaninov group opens with 'Khristos voskres'. The emotional state of the piece could not be more desolate, and Podleś commits to it totally, wringing out lines like 'The world is full of blood and tears' as if she is experiencing real anguish, and capturing an unmistakeable, bitter sarcasm in the voice when she sings of 'What our glorious century has achieved'. By way of contrast, her approach to the same composer's famous song about unrequited love 'Ona, kak polden', khorosha' is rather more reserved and innig than other interpretations of the piece. Podleś eschews the opportunity provided by the melismas to luxuriate in her own voice, and consequently captures a mood of wistful sorrow more appropriate to the metaphor in the poem than the brow beating that others engage in. A similar stillness pervades the first two verses of the first of the Tchaikovsky settings, 'Ya li v pole da ne travushka bïla', until the third verse when the dramatic situation is brought home and the girl's impotent outrage at having been forced into marriage with an elderly man she does not love is expressed with fearsome chest tones and a refulgent top. After a tender rendition of probably the most well-known song on the programme, 'Nyet, tol'ko tot kto znal', the Tchaikovsky group is concluded with the spirited 'Pesn' Zemfirï' in which Podleś really displays her vocal mettle at both extremes of her range. The inclusion of a twenty minute slot for the pianist to play a solo is unusual in recitals given by celebrity singers, but with a performance of this quality, is certainly welcome in this instance. Szymanowski's Masques Op. 34 are new to me but are a rewarding discovery. The music, in three movements, traverses elements that seem to include the impressionist and expressionist, and contains a fascinating variety of textures and sonorities. Ohlsson paces them masterfully, with subtle inflexion but always a sense of forward momentum that engages the ear to the end of the third movement. Mussorgsky's Songs and Dances of Death are a challenge of characterisation skills for any singer, with four personifications of death in four different moods, as well as having to narrate, and portray an anxious young mother. Given what has gone before in this concert, it is no surprise that Podleś is equal to the challenge, refreshed after her break during the Szymanowski. She employs countless different colours during the cycle, from the frankly guttural, as only she can, at the triumphant cry of 'Ti moya!' as death claims the beautiful young girl at the end of 'Serenada', to some finely drawn bel canto lines as she lulls the peasant to sleep at the end of 'Trepak'. Her seductive lulling of the baby to sleep in 'Kolïbelnaya' is as beautiful as it is chilling, but in the space of a breath she can turn on the panic and anxiety of the mother with moving immediacy. At the climax of 'Polkovodets', she is frighteningly commanding, expressing death's triumphal finality with extraordinary vocal authority. The performance of the encore, Rachmaninov's 'Prokhodit vsyo' is consistent with the high quality of the rest of the recital, although ending as it does on the line 'There cannot be any joy in my song!' it goes out on a mood considerably at odds with the rapturous audience reaction to the concert. 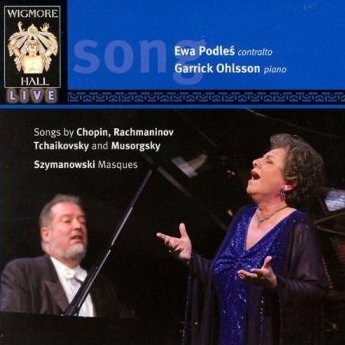 Such cheering is rare from the decorous Wigmore Hall public, but it is entirely appropriate. Although Podleś has a voice, and a style of vocal production, which many will find to be at odds with conventional notions of beauty in singing, there is no doubt that she successfully makes a virtue of it. The way in which she inhabits a piece and identifies with a text allows for a rare directness of communication, and between her artistic commitment and the elemental power of her voice, the listener is left, frankly, bowled over.